The Adventures of Annie and Her Boys: Who Needs a Kitchen? I am beginning to embrace this whole no kitchen-thing, probably because it will be relatively short-lived (I hope). Last night's dinner was quite tasty and colorful, if I do say so myself. Grilled chicken breasts paired with honeydew salsa, and a side of corn on the cob. On a paper plate, of course. Everything--prep, cooking, table setting, cleaning up--takes longer than usual, and we are producing an appalling amount of trash what with all paper plates/cups/utensils. I'm sorry, Earth--but soapstone countertops and inset cabinets were worth it; I'm sure you will agree. I will do penance (I am a former school spelling bee champion and I actually had to look up the spelling of this word, which definitely says something about me) by composting more regularly come August. The cabinets arrive tomorrow--I hope tonight won't be as bad as Christmas Eve, where each year I find myself wide awake pre-dawn, silently screaming for the rest of my family to WAKE UP ALREADY, DON'T YOU KNOW THERE ARE SPECIAL THINGS DOWNSTAIRS?? 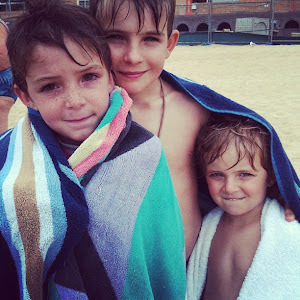 Somehow my children pick Christmas morning to sleep in; it's maddening (to me). Sam has already informed me that he will sleep just fine tonight. Bah humbug. I'm going to revel in my excitement for now, and I hope the cabinet delivery man sets his alarm, because he doesn't want to go up against a mother of three without a kitchen who is determined to keep this project running on schedule. 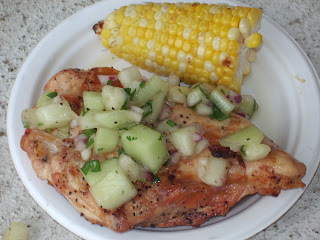 Grilled chicken with honeydew salsa. How imaginative! And it looks great. I've been madly in love with Annie for twenty years. I will always love her. Plantation 2009, and Come Home Sam!